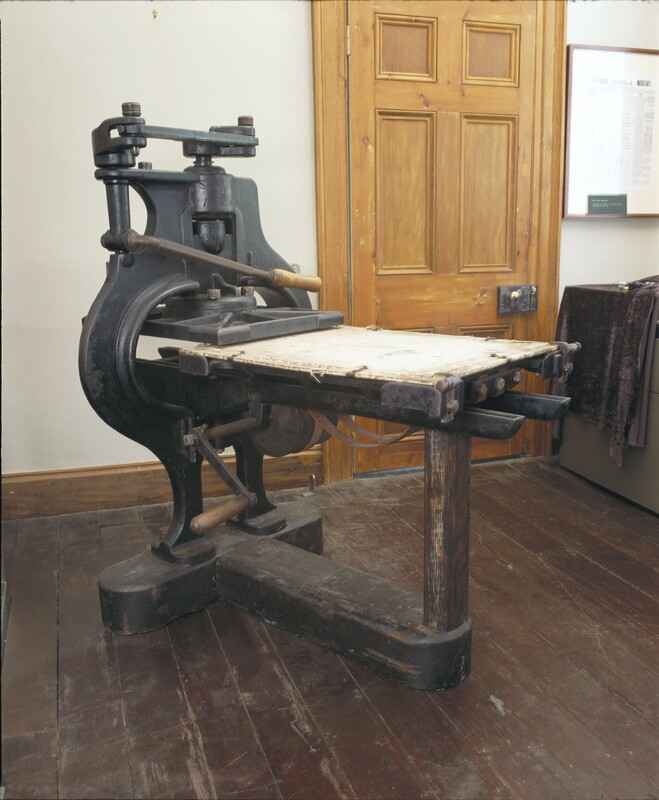 For over eighty years it was generally believed that the Stanhope press in the Tasmanian Museum and Art Gallery was Andrew Bent’s press. While this has now proven to be erroneous, the history of this press provides an interesting case study of how stories are made, take root and grow. The old printing press first came to public attention in 1931, when it was displayed, as Andrew Bent’s press, at an exhibition in Launceston. It was a star attraction and proved equally popular at a similar event in Hobart later in the year. Souvenirs printed on “Bent’s press” sold like hot cakes. In Launceston Mr. Murray White gave a talk on Bent’s imprisonment in the cause of press freedom. In Hobart Bent’s great-great-granddaughter, Lilian Grubb, operated the press one evening. The newspapers provided a lively commentary and propagated much misinformation, even asserting that Bent used the press to print government documents while incarcerated. Diverse views (all incorrect) were aired in the newspapers about when and how the press first came to Tasmania and where it had been over the course of its life. In the context of this debate it was revealed that Mr. C. L. Willis, the Launceston committee member who had arranged for the press to be loaned for exhibition, first saw it when he worked at Hobart’s Campbell Street gaol some years earlier. It had lain there unused for many years and he had been told by the oldest warder that it was last used in the gaol by Andrew Bent (Mercury, 4 Sep. 1931). This unverified and garbled story from an old gaoler appears to have been the sole basis for any Bent connection but by now the genie was out of the bottle and the flimsy nature of the evidence passed unnoticed in the general media excitement. The Press on display at the Hobart Exhibition, City Hall. The Mercury 3 September 1931. Although the sign gives the date 1816, the souvenirs printed in Hobart were facsimile copies of the Derwent Star newspaper from 1810! In between the two exhibitions the press was acquired by the Museum and until recently has been exhibited there and elsewhere as Bent’s press, written about as such, and regarded as highly significant, for both good and ill, because of its presumed provenance. Levy’s inclusion of a photograph of “Andrew Bent’s printing press” in a biography of Sir George Arthur (1953) suggests it was displayed as such around that time. In 1956 Dr. Crowther (a Trustee of the Museum when the press was acquired) stated in Biblionews that there was ‘no tangible evidence’ but, notwithstanding his doubts, the notion became entrenched through frequent repetition. Layer after layer of information about Bent (much of it useful and correct in itself) accumulated around the press over the years while the underlying assumption remained unquestioned. In 1972 Joan Woodberry included a drawing of the press in her book on Bent, and when interviewed by the Australian Womens’ Weekly, expressed her concern that nobody seemed to know where it was. The press was found in an offsite storage facility, reassembled to working condition and put back on display the following year. More souvenirs were printed and there was another flurry of publicity, with photos, in the Mercury. It is perhaps regrettable that the provenance was not examined more rigorously at this time, but Bent expert Woodberry seemed to entertain no doubts about its being his press and the necessary research would then have been difficult to do. As a Museum leaflet printed in 1976 indicates, it was now generally assumed that Bent obtained the press in 1823 or 1824. One chilly morning several years ago when my research was still in its early stages, I insisted my two adult children accompany me to TMAG to see the press used by their significant ancestor. They humoured me despite being a bit the worse for wear after a family wedding the night before, but have still not quite forgiven me. For as my research progressed and I discovered more about the presses Bent did use or which passed through his hands (there were in fact quite a few) I could find no convincing evidence that they ever included a Stanhope. Details of the first ‘new patent press’ which arrived in May 1823 were hazy but the later presses were all clearly either wooden presses or other makes of iron press. It seemed unlikely that Bent could have acquired a Stanhope iron press in 1823 and then the Columbian iron press which he announced with such pride the following year, even if he was aggressively expanding his business at that time. I hoped to resolve my increasing doubts by an inquiry to TMAG but there was very little information in their records. I read widely to try to work out when the press might have been made and finally enlisted the help of two experts – Belgian printer Erik Desmyter and Professor James Mosely, former librarian at St. Bride’s Foundation in London. With their generous assistance it was possible to work out an approximate date and to show that the press was too young to have been Bent’s. The Stanhope press was named after its inventor Charles, third Earl Stanhope (1753-1816) and represented a quantum leap in printing press technology. Its cast iron frame and system of levers gave unprecedented power and precision in comparison with wooden presses. The first press made to Stanhope’s design was built (probably in 1803) by London smith and engine-maker Robert Walker. Stanhope never patented his invention so there were other manufacturers, but the Walker family remained prominent and their presses were highly regarded. After Walker’s death his widow Sarah continued the business and was later joined by her son in law Samuel James Spiers who in 1833 advertised that he had “succeeded to the business lately carried on by Mrs. Walker” and had made several improvements to the press. 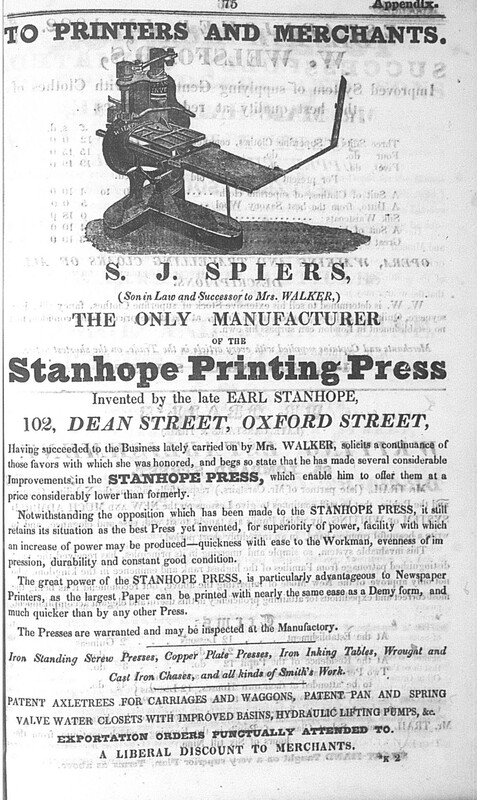 Spiers, who died in 1843, continued to make Stanhope presses until around 1840 or 1841. Until the late 1830s the name Walker and Co. was listed in London directories as well as his own. Altogether around 600 Walker presses were made, most being undated but bearing a unique serial number. The TMAG press is a Walker-made Stanhope and is inscribed, in two separate places, “Stanhope invenit” “Walker fecit”. The platen is probably a later replacement from some other sort of press. As number 633, it would appear to be a very late Walker indeed. The next youngest survivor, according to Desmyter, is no. 567 which bears the name of Spiers. Curiously the higher numbered TMAG machine does not. Desmyter’s own Stanhope, no. 535, also has Speirs’ name but Desmyter thinks it may have been added some time after manufacture. After extensive research he has dated no. 535 to around 1837. It appears however that the first digit on the TMAG press may have been altered, and the original number was possibly 533. The reason for this is a mystery. It may represent an error when the number was first added, or possibly indicate that the press was returned to the manufacturer and sold as a reconditioned model, perhaps having been hired out. Either way the press is still a late one. If it had arrived in Hobart in 1823, one would expect it to have a number in the high 200s or low 300s. Presses 206 and 209 were sold in 1818, and presses 225 and 312 have been dated to 1819 and 1823 respectively. Further, the appearance and technical features of the TMAG press suggest it was made in the 1830s and my research indicates Bent definitely did not get a Stanhope at any time after 1830. If it was not Bent’s press when and how did the Stanhope press first come to Tasmania? A search of Trove showed that in 1832 a demy sized Stanhope arrived on the Henry. Bent’s Columbian and Imperial presses also arrived on this vessel but the Stanhope was for another printer, probably Henry Melville or James Ross. Perhaps still too early to be the TMAG press, it could have been the press purchased by Mr. Dowling from Ross’s successor Elliston to send to South Australia in March 1838. The Launceston Advertiser had a royal sized Stanhope for sale in 1842 and a super royal was advertised by John Moore, printer of the Hobarton Guardian, in September 1847. This is all inconclusive. If the TMAG press was, as it appears to have been, in use by prisoners in the Campbell Street Gaol in the 1890s, it may well have been an old press from the Government Printing Office. Further research is needed but given that no reference to it has, at least so far, been found in TAHO, it is quite possible that the press arrived in Hobart early in 1839 with newly appointed Government Printer James Barnard. Barnard was in England at the time of his appointment and purchased all his equipment there before he left, submitting receipts to the Colonial Agent for reimbursement (various letters in TNA CO280/100). While no itemized accounts have been found the timing is perfect for his press to have been the TMAG Stanhope. Although it was never Andrew Bent’s, the TMAG press is still significant as a relic of Tasmania’s colonial printing days, as an example of an important development in printing press technology and as a rare survivor of the excellent presses made by the Walker family. Only two other Walker presses are known to be in Australia – no. 200 in the Adelaide Museum (obviously older than the TMAG press) and no. 429 in the Powerhouse collection, Sydney. Thanks to Erik Desmyter, James Mosley and TMAG staff, especially Ian Terry. Information about the press on TMAG website has been amended.